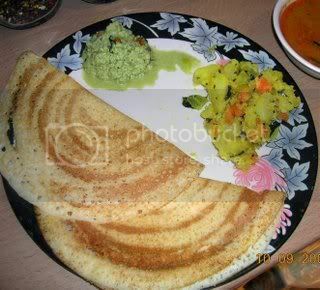 This dosa is made of very fine Rava( sooji, semolina, obbattu rave ) and rice flour. Mix the Rava , Rice flour, curds,chopped coriander and salt with one cup of water and let it for 5 minutes..In a small pan add a spoon of oil . When it is hot add mustard seeds, hing, chopped onions, chopped green chillies and add this seasoning to the above batter . Now mix the batter thoroughly with liberal quantity of water . Soak the rice separately and the rest of the ingredients with the urad dal for about 6 to 8 hours..Grind them separately and mix them with salt to taste and leave it to ferment in a warm place about 10 to 12 hours..
Wah! I tried making dosa but it did NOT come out the way I had wanted it to. 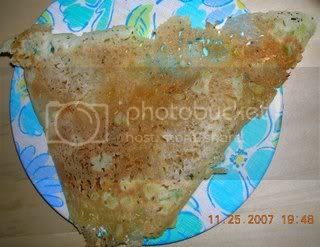 :( Good to see some realistic dosa pictures here. :D Expert hands alwa eshtiddru. HOW SAFE ARE THE TOYS?? ?